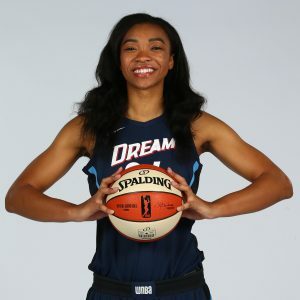 Imani McGee-Stafford, Women’s National Basketball Association (WNBA) player for the Atlanta Dream and a mental health advocate, joined StrongMinds in honoring of Mental Health Awareness Month in May 2018. Imani promoted the work of StrongMinds on social media to help raise awareness of the organization and the importance of mental health. Scroll down to view the 30-second public service announcement (PSA). Earlier this year, Imani met with Sean Mayberry, the Executive Director and Founder of StrongMinds, to learn more about the organization. In addition, she had the chance to video chat with Gorret, one of the Mental Health Facilitators in Uganda. Gorett has the unique perspective of being a former StrongMinds patient turned StrongMinds staff member. “I truly believe in the work being done by StrongMinds. Hearing Gorett talk about the impact of her talk therapy group on her own life and learning how she has gone on to help literally hundreds of women suffering from depression inspired me,” shared Imani.